Apartment 528 is doing another contest. Yea! This time, you can enter for a chance to win a 10% discount on classes at 3rd Ward, a design center based in Brooklyn, NY. The contest starts today and ends Sunday, June 28th with the winner announced Monday, June 29th. 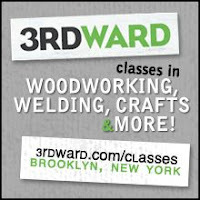 If you're able to make it to Brooklyn once a week, I HIGHLY suggest looking into 3rd Ward. They offer classes in everything from woodworking, furniture making (my two faves! ), and welding to jewelry making, illustration, and video production. They even have Etsy craft classes! All of 3rd Ward's classes are super affordable...whether you're a hobbiest, DIY-er, or looking to develop your skills professionally, you'll be able to work a few classes into your budget. If you're looking to save a little while still getting the most bang for your buck, check out one of 3rd Ward's memberships, starting at just $39/month. By becoming a member, you gain access to their 20,000 sq. ft. space, discounts on classes, use of their studio space and media labs, exhibit space, and invites to their social events and networking opportunities. It's enough to make you want to move to New York! I'm all about building so I will of course highlight their woodworking classes. To get started, you take Intro to Woodworking to get a feel for working with both hand and power tools. Then it's off to Furniture Design and Construction class. The class is taught by Steve Pino, a custom furniture designer who's done pieces for Brooke Shields and Steven Tyler, just to name a few! This next offering is probably number one on my list. Yesterday, I electrocuted myself while rewiring a hanging light into a sconce for my headboard. Not fun! If I'd taken 3rd Ward's Light Fixture class, maybe I wouldn't have mixed up the wires! The class, taught by designer Daniel Rossi, incorporates wiring and woodworking, all while using eco-friendly materials. 3rd Ward also offers classes in furniture refinishing, screen printing, handmade skincare, jean assembly, and much MUCH more. Check their website for a full list. First, only participate in the contest if you're serious about taking a class at 3rd Ward. We don't want a good discount to go to waste! Like last time, there are THREE ways to enter. Post a comment below telling me which 3rd Ward class you'd like to take. Each comment counts as ONE entry. Post a tweet about this contest on Twitter (@Apartment528) linking back to this blog entry. Put the link to your twitter post in a comment below so I can find it. Each twitter link counts as TWO entries. Link back to this contest on your blog. Put the link to your blog post in a comment below. Each blog link counts as TWO entries. The contest ends at 11:59PM on Sunday, June 28th. One winner will be chosen at random and announced Monday, June 29th. Furniture making and illustration. As a designer, making my own furniture is a dream come true, and I would like to be, also, create decors that compliments my design.